Many people make assumptions about alcohol and other drug problems. The truth is that alcohol and other drug problems can vary in onset, duration and resolution. More serious forms of alcohol and other drug problems are known as addiction. 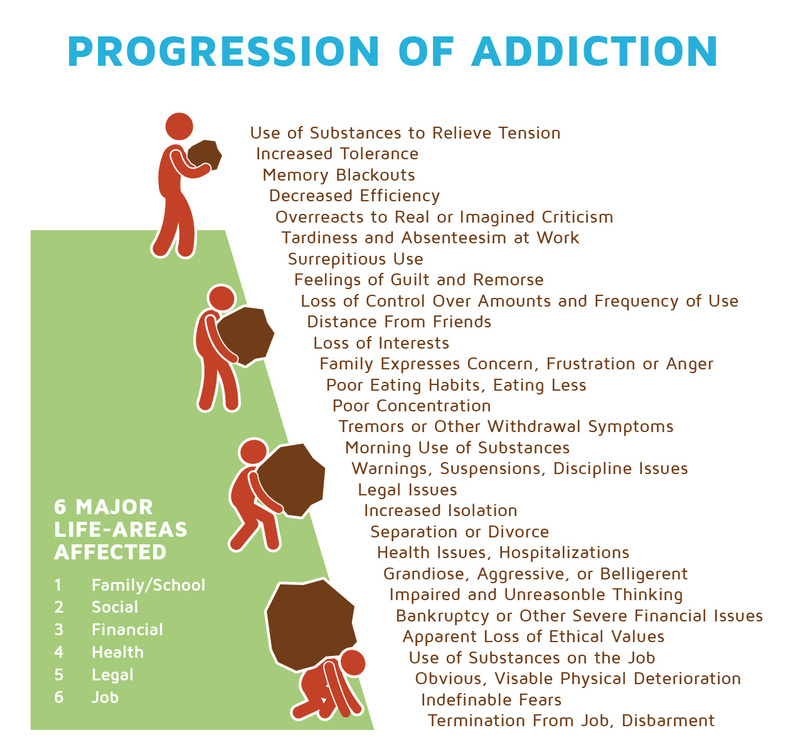 Addiction 1) is a disease with characteristic signs and symptoms, 2) is similar to other chronic conditions (i.e. unlikely to be resolved following a single brief treatment episode without more enduring changes), and 3) follows a progressive course that, if left untreated, will only get worse. It is well established that lawyers (including judges) have twice the rate of alcohol and other drug problems as the general population. There are many contributing factors, including the often unrelenting stress and emotional demands of the job. Unfortunately, the very qualities that can make us successful lawyers, such as being analytical, self-reliant, highly skeptical, perfectionistic, critical, and skilled negotiators/persuaders (i.e. manipulators), can also drastically impede our ability to admit that we have a alcohol or other drug problem. The need to be in control and an unwillingness to admit “defeat,” (i.e. that we have been unable to solve our problem by ourselves) greatly reinforce the denial already inherent with the disease, thus enabling the disease to progress. And while most lawyers highly value the practice of law and take pride in providing excellent work for our clients, lawyers who suffer from alcohol and other drug problems are substantially more likely to fail their clients, commit malpractice, experience disciplinary action and face disbarment. Approximately 60 percent of all malpractice claims and 85 percent of trust account violations involve alcohol and other drug problems. Lawyers suffering from alcohol and other drug problems are also more likely to suffer from depression and anxiety and to commit suicide. It is important to note, that alcohol and other drug problems are not a matter of will power, moral character, or strength versus weakness. It is a disease. However, unlike other diseases, it creates a pattern of deception and denial that separates those affected with the disease from the people who can help and support them. This separation, along with the lack of support and accountability, creates an environment of isolation which allows the disease to progress unimpeded. A chart showing the general progression of the disease can be found here. Despite the level of severity, highly effective treatment is available. It may initially be difficult to identify that what we are experiencing is related to alcohol and other drug problems, because we may be distracted by events or consequences that seem unrelated (a failed marriage, loss of a job, kids who will not speak with us, financial problems, “friends” who keep taking advantage of us, a DWI, etc.). We may be focusing all our energy on trying to fix those circumstances. But those circumstances are really just symptoms of the underlying alcohol and other drug problem; they will only be “fixed” when the alcohol or other drug problem is addressed and properly treated. It may be difficult to articulate something that we don’t yet fully understand ourselves. It may also be difficult to ask for help, but alcohol and other drug problems will only get worse if left untreated. The good news is that people with alcohol and other drug problems can and do recover. There are more than 23 million Americans in sustained recovery from an alcohol or other drug problem. There is hope and help available for individuals and their loved ones. The earlier we seek help, the better. Please call or email us today if you have questions about a possible alcohol or other drug problem.